Tom Coburn, R-Okla., said Sylvia Mathews Burwell has strong character. 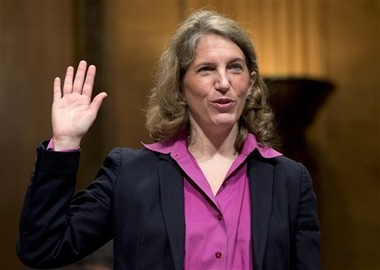 (Bloomberg) — Sylvia Mathews Burwell, poised to become President Barack Obama’s new Health and Human Services (HHS) secretary, met little opposition and much praise today at the final hearing before the Senate starts to vote on her confirmation. Burwell, a former MetLife board member and the head of the Office of Management and Budget, faces votes by the Senate Finance Committee and the full Senate. She is on track to replace the current HHS secretary, Kathleen Sebelius, who announced her resignation April 10. “You will have your work cut out for you,” he told her at today’s Finance Committee hearing. Sen. Tom Coburn, R-Okla., introduced Burwell to the committee and recommended her confirmation. “When you have someone who is competent and also has strong character you find a way to get past your differences and try to solve problems,” he said. The U.S. Department of Health and Human Services has an annual budget of about $960 billion. In addition to overseeing implementation of the $1.4 trillion Patient Protection and Affordable Care Act (PPACA) coverage expansion provisions, the department oversees Medicare and Medicaid. Access to care, affordability and health-care quality “seem to me to be the north stars” of PPACA, Burwell said at the hearing. Sen. Charles Grassley, R- Iowa, said Sebelius had damaged relationships with his party by seeming to implement PPACA in cavalier style, without consulting Congress. Burwell said she hoped he would call her directly with concerns.